Federal transportation investigators say an Alexandria woman killed by smoke that filled her Yellow Line train in January 2015 would still be alive if Metro had followed its own procedures. WASHINGTON — Federal transportation investigators said Tuesday that an Alexandria woman killed by smoke that filled her Yellow Line train in January 2015 would still be alive if Metro had followed its own procedures. 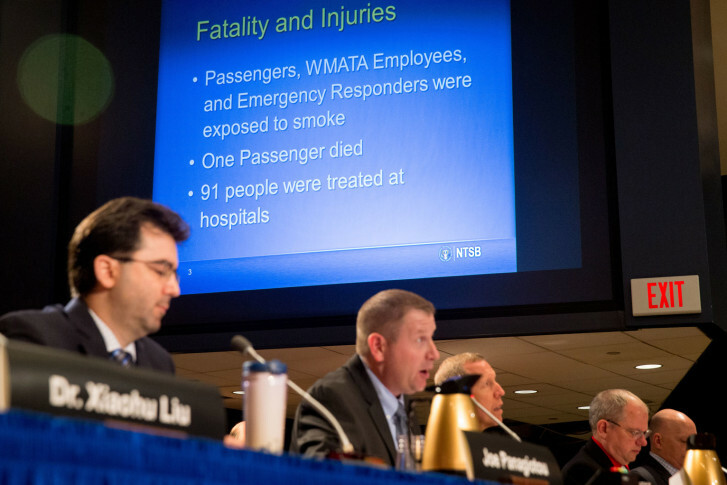 The National Transportation Board was meeting Tuesday morning to finalize its findings into the deadly smoke that filled the train tunnel and the L’Enfant Plaza Station and sickened dozens. Safety board investigators said Metro’s troubled Rail Operations Control Center did not stop all trains as they should have under Metro policy at the first report of smoke in tunnels. While there were a series of other problems identified, including with Metro’s power system and the emergency response, the 91 people sickened and the death of Carol Glover could likely have been avoided if they had been taken off the train at the station. Instead the full train sat amid the acrid electrical smoke for at least 35 minutes as riders coughed and choked. They received little information about what was happening and didn’t know when help would arrive. By 4:27 p.m. all riders, including Glover, had been removed from the train — more than an hour after the Yellow Line train stopped in the tunnel. Stay with WTOP for updates on this developing story.